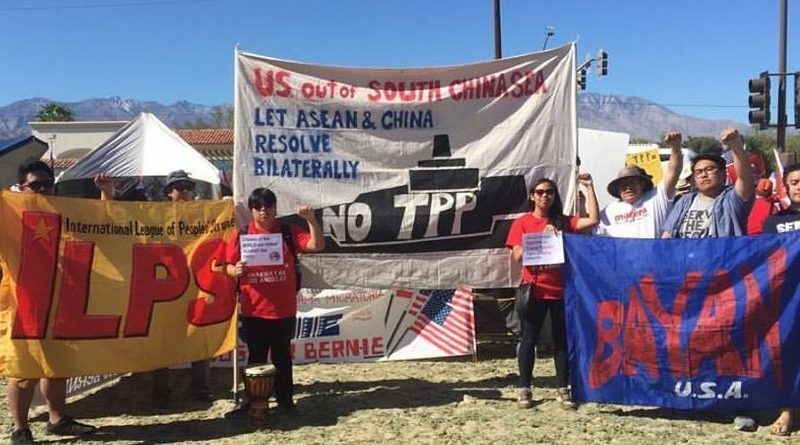 As Obama convenes US-ASEAN Summit in California, Fight the TPP! Fight neoliberal globalization! Today in Rancho Mirage, California, the Obama administration has called for a gathering of leaders of the Association of Southeast Asian Nations (ASEAN) to discuss its agenda of ensuring US economic hegemony in the region through so-called free trade agreements and deals such as the Trans-Pacific Partnership Agreement (TPP). Since the end of World War II, the US financial elite has relied on and maintained the Asia-Pacific region as its largest market for US exports, and the largest dumping grounds for US surplus goods. The total value of the US export market in the region amounts to nearly $1 trillion in goods and services. The region, and in particular the South China Sea, is also home to some of the world’s largest deposits of oil, minerals, and other natural wealth and resources. It is also where the international shipping lanes crucial to global trade and commerce between the Eastern and Western Hemispheres are located. The US ruling elite economically controls and extracts super-profits from the region through neoliberal globalization imposed through instruments such as the International Monetary Fund, the World Bank and the World Trade Organization. The campaign to aggressively open up and dominate the Asia-Pacific through economic liberalization, deregulation, and privatization in favor of US monopoly capital has not only undermined the sovereignty of the countries in the region, it has destroyed its local economies and spurned chronic crisis. A widening span of impoverished and backward rural economies, widespread abject poverty, and worsening food insecurity grows throughout the oppressed and dependent countries in the region, and because of this, so does people’s resistance movements to imperialism, from workers strikes to armed agrarian revolutions. US geopolitical strategy in the region has also translated to its vast militarization. While the Obama administration announced in 2012 it would be “pivoting” 60% of its naval forces to the region, in reality the US ruling elite has maintained the largest of its global regional military commands– the Pacific Command– since 1947. As the largest and oldest of all the unified combatant commands of the US Armed Forces, the US Pacific Command (USPACOM) encompasses 36 nations and territories, including Antarctica, Russia, China, India, Pakistan, North and South Korea, Japan, the countries of Southeast Asia, Australia, New Zealand, and Hawaii. Today, US imperialism’s unipolar dominance is increasingly challenged by competing and emerging monopoly capitalist powers, forcing the US ruling elite to desperately push neoliberal economic policies, trade deals, and militarization in the Asia-Pacific region and other parts of the globe. The secretly negotiated 6,000-page TPP released by WikiLeaks last October 2015 reveals treacherous terms and standards designed to further strengthen monopoly capitalist control over the global economy and the world’s resources. Beyond being just a trade deal, the TPP also plays a key role in advancing the geopolitical interests of US imperialism to maintain its hold in the Asia Pacific and contain the rising power of China in the region and beyond. Meanwhile, here in the US, US foreign policy of hegemony through neoliberalism and militarization abroad has translated a worsening domestic crisis characterized by financialization and debt, the outsourcing of major US job industries, the elimination of the public sector through privatization, and a domestic economy reliant on the US military industrial complex and mass incarceration rather than industrial production. From the militarization and growing repression of US police to attacks on public sector jobs to gentrification and the privatization of healthcare and education to growing poverty and crisis in cities such as Flint, Michigan, the impacts of neoliberal globalization are also felt within US borders. As the peoples of the Asia-Pacific region continue to rise up and resist neoliberal globalization, the working and oppressed people – the 99%– of the US rising against the domestic impacts of the crisis must also link and raise these struggles to the crisis of imperialism and stand with resistance movements in international solidarity.